If you're anything like me when it comes to dogs you have had that have died, you think that when they do go, there can never possibly be another that you will feel as close to or love more than you did the one before. I have had 3 dogs and I know that that's what I thought every time one of them died. Bali and Bella were the first. 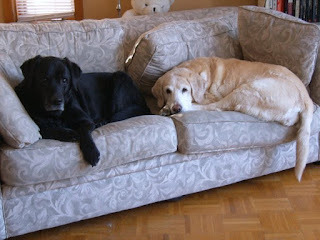 They were a male and female black and blonde Lab respectively. They died about 6 months apart. They were both 14 years old. I had never intended to have to go through that so close together, but when you rescue a dog, their age is their age. As it turns out, Bella, the rescued one, was only 6 months younger than Bali. It's going on about 7 years now since they both went to Rainbow Bridge. What a wonderful notion that is, the Bridge. A place where all dogs go after they die, where they are free of any and all pain they may have suffered. Where they can run free to their heart's content. Where the saying goes, that they will meet you there too one day. I don't know what I believe in after death...I want to believe there's something. I wish I could know for sure...if it Rainbow Bridge, or something like it, well, what more is there to say? After Bali and Bella, came our blond Lab Biscuit. I remember the first time the vet saw him, he said, wow, he's about a 1000 biscuits! He was a big boy, no doubt. Biggest Lab I ever saw. Close to 100 pounds when we got him. Outside of the SPCA, I didn't know much about dog rescue. I mean, I guess I knew that these organizations existed but I just never paid much attention. Rosie Animal Adoption came to me not long after Bali's death. We still had Bella but while she was still with us, her age had caught up to her and she was a shell of her old self. I guess with Bali being my first dog, having had him from the time he was 8 weeks old and having been with me through so many heart aches and difficulties, it only deepened the grief I felt when he died. 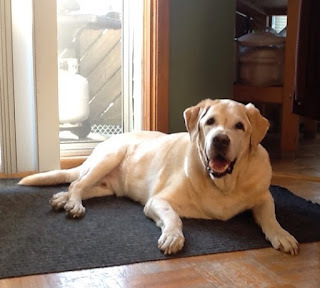 I started looking online for another male Lab, maybe a week into Bali's death. I don't know what it was I was looking for just that I felt like I needed another dog as quickly as possible. I wasn't trying to erase Bali's memory or replace him (or maybe I was) but I was so distraught I felt like if I had the distraction of another dog to care for, the pain might not be so bad. I came upon Biscuit's picture and told my husband that this was the one. He said how can you know that, you never even met him. I said I just know. I placed a call to Rosie's and after they vetted me, I was told I could go and pick Biscuit up. I remember being a little surprised there was no meet and greet with the dog first but at that time, if you were the right adopter in their eyes, the dog was yours. And so it was that Biscuit became ours just 3 days before Christmas.